"Where do you live?" asked Tojo as we sat down at the sushi bar. "In Vancouver", we replied. "What??? And you've never been to Tojo's?!?! ", gasped Tojo. Yah, really. It's not like we were avoiding the place; but honestly, it isn't exactly the most affordable restaurant. I know, I know, the cost can be tempered somewhat by ordering a la carte. However, what we really wanted was the Omakase at the bar. Oma-what? Omakase, literally translated means "it's up to you", or promoted on some menus, "to entrust". Whatever the meaning, it essentially allows you to let the chef know your likes and dislikes and then "trust" them create a menu for you. With this form of dining, it comes with a cost. Depending on which restaurant you visit, it can range from as little as $40.00 per person to no actual fixed price. At Tojo's, if you sit at the bar, it is a minimum $150.00 per person. Think of it as a tasting menu, Japanese-style. Now, when I refer to "we", you might be thinking of Viv and I. Well, Viv would normally be with me for such a treat of a meal; but not this time. No, no, don't worry, it's not a secret lover or anything. I really don't need Viv to beat me to a pulp... Rather, my dining partn er was Pomegranate. Huh? You see, he was going to pay for the meal tonight. Hey, I wasn't going to pass on that offer! Being that we arrived near opening time, we sat right in front of Tojo. 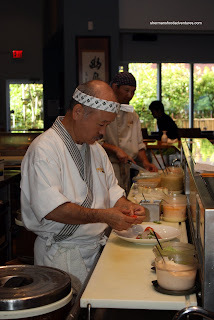 He made sure we knew that he was "the best sushi chef in town". Arrogant? Yes. Deserved? Debatable; but I can understand his confidence. I'm quite familiar with Tojo, his story and achievements. Pomegranate wasn't as clear, so it was a little amusing that Tojo presented him with a resume of sorts as reading material. Tojo first came to Canada in 1971 and after working at several restaurants, opened his own in 1988. 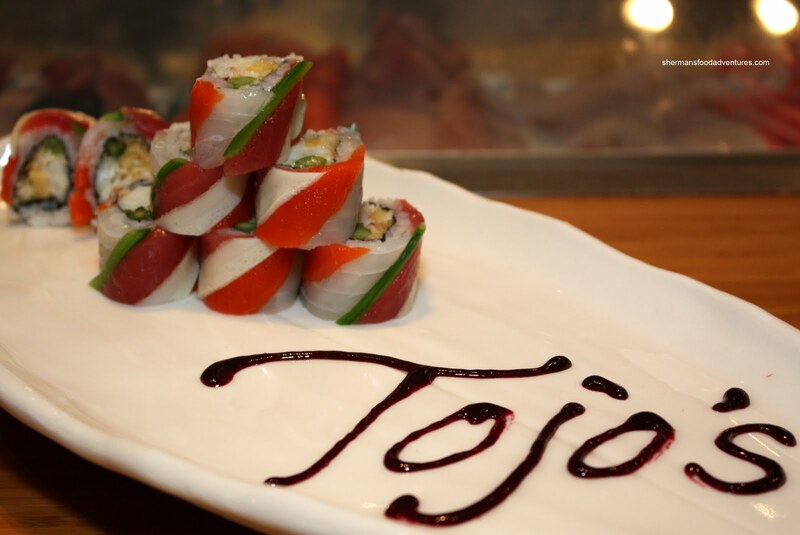 Despite an ongoing debate of their origin, Tojo has the distinction of creating the California Roll and the BC Roll. His celebrity chef status is reinforced by countless TV appearances including Martha Stewart and Anthony Bourdain. Much like other local celebrity chefs Pino Posteraro, John Bishop and Vikram Vij, Tojo is present at his restaurant on a nightly basis. After asking a few questions about what we would like to eat, he set about creating a individualized menu for us. In reality, there are certain standard dishes that are on rotation for some mix and matching. With that being said, the people around us had totally different items. Although Tojo has plenty of help in the open kitchen, he did personally make some of our items with the first being the Tuna Tartare. 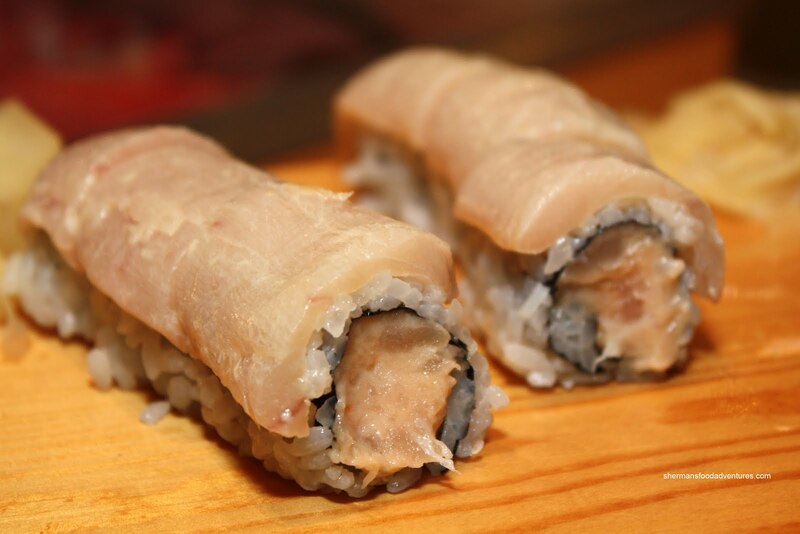 Fresh from a cylindrical mold, the tatare consisted of albacore and red tuna with bits of cucumber and mountain yam. A good amount of freshly grated ginger sat atop while a tart vinaigrette (consisting of lemon & soy) rested on the bottom of the plate. 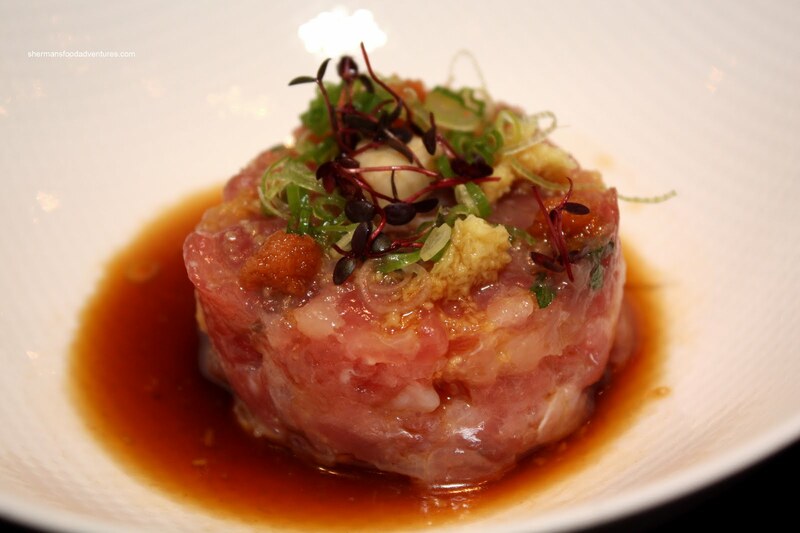 Despite the strong vinaigrette, the natural sweetness of the extremely flavourful tuna shone. The bits of veggies were a nice textural contrast. Pomegranate thought this appy was refreshing and help whet his appetite for more. Next up was the Zucchini Blossom stuffed with scallops. The blossoms were filled with both scallops and scallop mousse then fried tempura-style. One piece of pepper and garlic flower each rounded out the dish. Reminiscent of the one I had at La Quercia, the blossom was absolutely delicious. Delicately fried, pipping-hot and full of naturally-sweet scallops, we could've eaten a dozen of these easily. 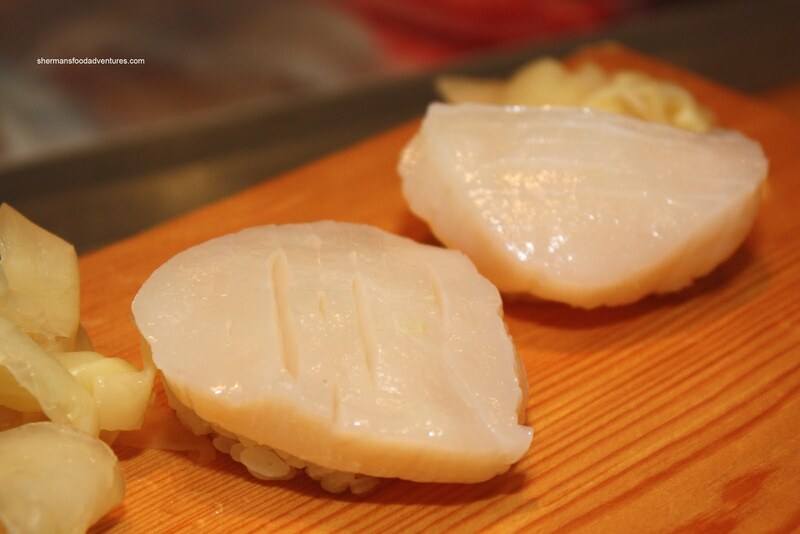 Tojo presented us next with a plate of thinly-sliced Tako. Pomegranate wasn't paying attention and really thought we were getting a Japanese version of a taco. Great job. Nice way in looking like a fool in front of Tojo! 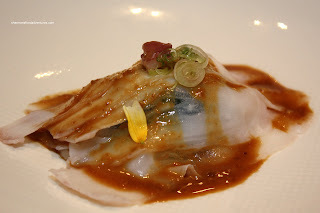 Hidden beneath the tender slices of octopus was wakame, vermicelli and pickled daikon & carrots. The tako itself was topped with what appeared to be a spicy sesame miso dressing. When we picked up all the ingredients into one bite, it revealed many different flavours at work with a bit of tart, a touch of spice and natural sweetness. When we got to the Smoked Sablefish, it was a bit of a letdown. 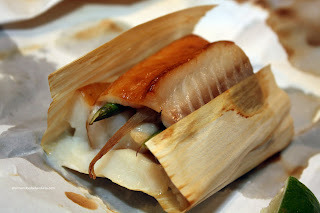 Baked and presented in parchment paper, the sablefish was stuffed with mushrooms, asparagus and mango. I thought the sablefish was overcooked; thus becoming a bit hard. This essentially negates the buttery texture we look for in sablefish. Flavourwise, it was pretty good with a nice smoked aroma. Pomegranate remarked that the mango didn't have the zing he was looking for. 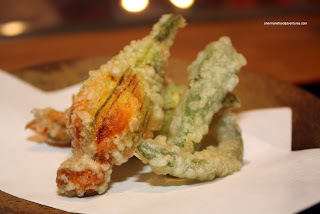 complimented nicely by cucumber, tempura bits and tobiko all in a light spicy mayo. 2 of the simpler items arrived back-to-back. The Snow Crab Nigiri was good by itself. With a large piece of sweet and slightly salty leg meat on top of the excellent sushi rice, it was a nice treat. 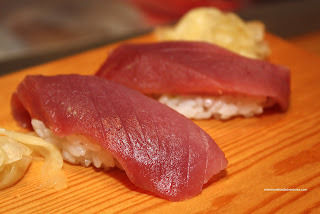 Once we downed the piece of sushi, Tojo presented us with Red Tuna Nigiri. Again simple; yet ultimately delicious. The slice of tuna exhibited an understated sweetness and the texture was soft without being mushy. A really high quality piece of fish. From simple to something slightly more intricate was the Celebration 2010 Roll. We watched Tojo's sous chef make this slightly complicated creation by first lining saran wrap with strips of tuna, tai, salmon, spinach and egg, then he proceeded to fill the inside of the roll with crab, asparagus, tempura bits and pineapple. 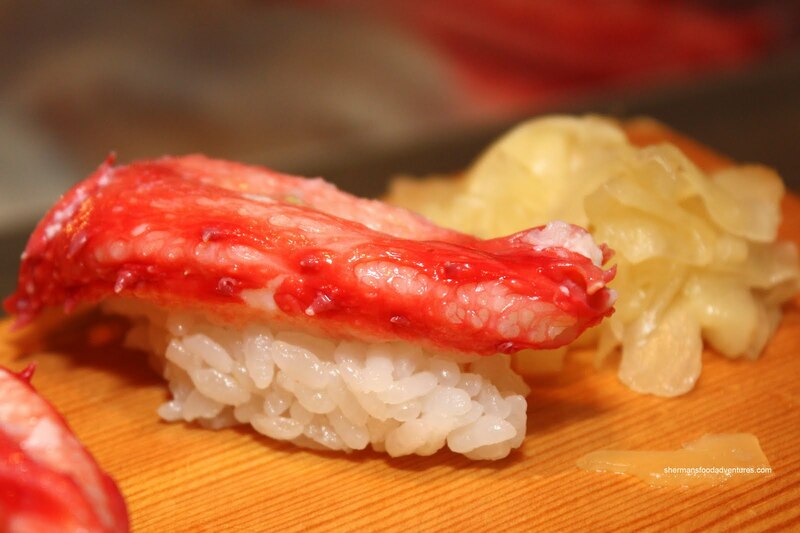 It was presented on a large plate with Tojo's written in blueberry jam. Although it was a visually appealing roll, we both felt it was just okay. A slight variation of the rainbow roll found at most other sushi joints, this did not separate itself enough to warrant the high price tag (regular price is $26.00). We also felt that the pineapple overwhelmed everything else. 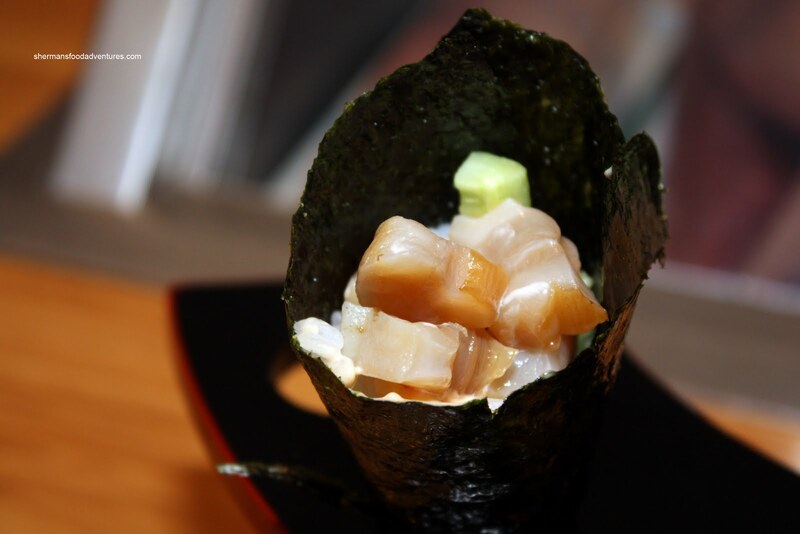 If the geoduck cone was our favourite, the Hotate Nigiri was a close second. With the largest piece of scallop I've ever seen served as nigiri, this was an absolute treat. We could barely see or even notice the rice underneath. The darn thing was so sweet and buttery smooth. This exemplified how the simple use of a quality ingredient can be absolutely delicious. While placing it down on our geta plate, Tojo proclaimed the Northern Light Roll as his favourite. I'm not sure if that was my favourite personally; but I definitely liked it. 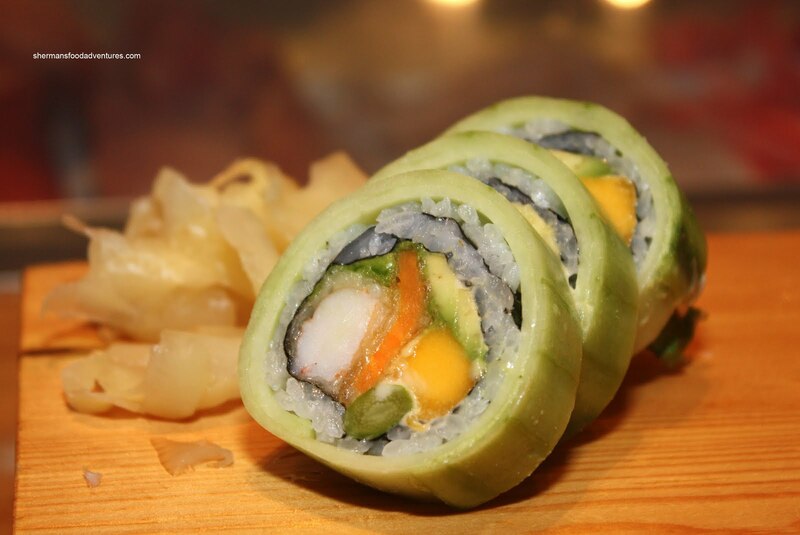 Filled with prawn and yam tempura, avocado, asparagus and mango with cucumber crepe on the outside, we found this roll to be refreshing to eat. Tojo insisted we use no soy sauce and we could see why. Eating it "as is" afforded the natural flavours and textures to shine. At this point, we were debating on whether to stop or keep going. You see, with Omakase at the bar, Tojo only stops when you tell him to. If you keep eating, the bill will only continue to climb! Tojo helped us make our decision by presenting us with our last item being the Spicy Tuna Roll. When he placed it on our plate, it didn't look like any spicy tuna roll we'd ever seen before. In the middle rested the "spicy" tuna mixture with more "melt-in-your-mouth" tuna on top. Normally, I'd be quite upset at mushy tuna; but in this case, it wasn't mushy. Rather, it was super smooth and fresh tasting. The roll itself wasn't all that spicy. It was more sweet than anything. We finished up our meal with the Green Tea Creme Brulee topped with seasonal fruit and a sesame chip. As with everything in the meal, the dess ert was understated. 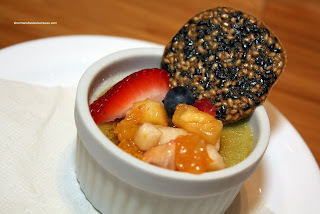 The combination of the semi-sweet brulee, tart fruit and nuttiness of the sesame chip equated to balance. My only gripe would be the burnt sugar, I would've liked more caramelization. Now, how much did this meal cost? How about close to $500.00 with sake after tax and tip? Lunacy! Yes, that is the GDP of a small country. What is essentially a tasting menu, it is the most expensive meal we've ever had. The burning question is: was it worth it? Honestly, that is a loaded question. From a pure value point of view, absolutely not. The HST alone could've gotten us a very good Japanese meal somewhere in town. However, people do not come to Tojo's for value. Foodies from around the world visit Tojo's for the experience and the audacity of spending that kind of dough. Of the 11 items we had, I would say 3 blew us away, 6 were good and 2 "meh". 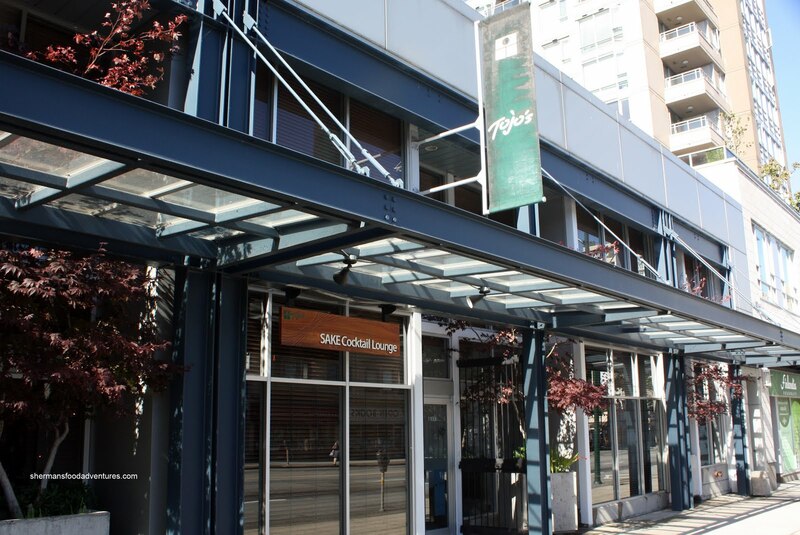 So why does Tojo claim to have the best sushi in town? Simple, the raw materials are top-notch and sometimes over-the-top; the level of care and effort put into some of the creations is gastronomical art; and probably most influentially, he has a reputation. As much as we can easily bash the place for being overpriced; we have to realize that people are not looking for a deal here. Much like buying a Ferrari or a Rolex, a premium is paid for something that is marginally better than something costing 1/4 as much. For me, it was a meal I needed to experience, no ands, ifs or buts. We were fully aware of what we were getting into. If we were looking for a better bang for the buck, a trip to Ajisai or Octopus' Garden would be in order. But if your intentions are to go for the experience; or do the "been there, done that"; or just simply to brag about it, then bring your paycheque to Tojo's. The reason why the quality is top notch is because Tojo has nothing frozen. They buy the live fish the same day and butcher it, then keep the fish frozen. Thus, is a top notch piece of expensive fish you'll ever taste. The concept is the same with any product, for example, if you butcher a live chicken or cow it would taste amazing because the product did not start rotting. Wow! Thanks for the journey Sherman. What a treat. That was definitely in line with what my experience was about 6 months ago. Pretty incredible quality seafood, with generally well managed restraint re: letting the seafood shine. I was curious to see if you would have had the same slightly over-the-top service experience we got; we weren't sitting at the bar like you did, but rather at a booth. I found the "kawaii" tone of the waitress and the constantly-bowing waiter kind of ridiculous (mind you I was the only half-asian at a table of very non-asian people). Dare I say it almost cheapened the experience...? From the pictures and the descriptions, it didn't seem like the food was worth $250 per person. The ingredients, high quality they may be, seemed common enough. I guess having Tojo himself serve you counts for $100 per person -- I would have no problem paying $150 per person for the food you got (and that is generous), but $250 seems a bit much. my japanese friend told me her parents and a big part of the japanese community don't like Tojo because of his arrogance. Kim, for clarification, the $500 included food, sake, tips and tax. Not sure if that makes a difference because it is still $500! But you are right, it is not really worth it in the normal sense of things. It is definitely a place you go to indulge and really don't care about what you spend. Doug, you are right, the fish was out of this world fresh compared to everywhere else. For those who complain about the food at Tojo's, I would like to differ. It may not meet the expectations when we relate it to the price. However, the bottom line is the food is indeed good and fresh as can be. Is it worth the high price tag? Probably not for the general public. For those who have that money to burn, of course. What we can say is the food is good, and the prices are a reflection of the operating costs and the fact it is "Tojo's". We'd spend way more money eating at Morimoto's restaurant in NYC. Chris, I'm pretty sure this will be the most expensive meal I'll ever have. egirlwonder, the service we got was not like yours. Possibly because we were sitting at the bar? Once again, great food. Just expensive. JS, as mentioned to Kim, the $500 includes everything. But then again, it is still expensive. For that price, I can do the Lumiere tasting menu for less. But then again, each to their own. 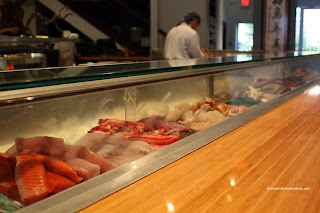 Morimoto's restaurant in NYC is much better than Tojo's and cheaper (considering what you get for your money). How hard is it to get fresh seafood if your restaurant is not small operation and "mom&pop"? To charge $500 solely based it's fresh, that's lame. They need more than it's fresh to charge that kind of price. MOrimoto's and Nobu definitely are more upscale with much better decor and ambiance than Tojo's. You also get better service in Morimoto's and Nobu. At Tojo's, waiters don't even speak English well, it's hard to communicate. I went to Nobu in NYC. It's outstanding. Of course, it's fresh. The dishes I got in Nobu look better than Tojo's skimpy dishes. Not to mention Nobu uses more and better ingredients. There is a reason why Tojo is stuck in Vancouver. If he was any good, some investor would hire him and give him a fancy restaurant to run in NYC. Nobu is also cheaper than Tojo's considering what you get for your money. You get more honest and solid food in Nobu. Too funny. Now we're comparing the culinary scenes of New York vs. Vancouver and chefs who have different styles and influences. It's important to remember that each chef is an artist in their own right and just because an artist's 'portfolio' isn't 'showcased' in NY, it doesn't mean their work is 'inferior' than one who is. I've haven't yet dined at Tojo's for the same reason, just couldn't justify spending crazy amount of money. 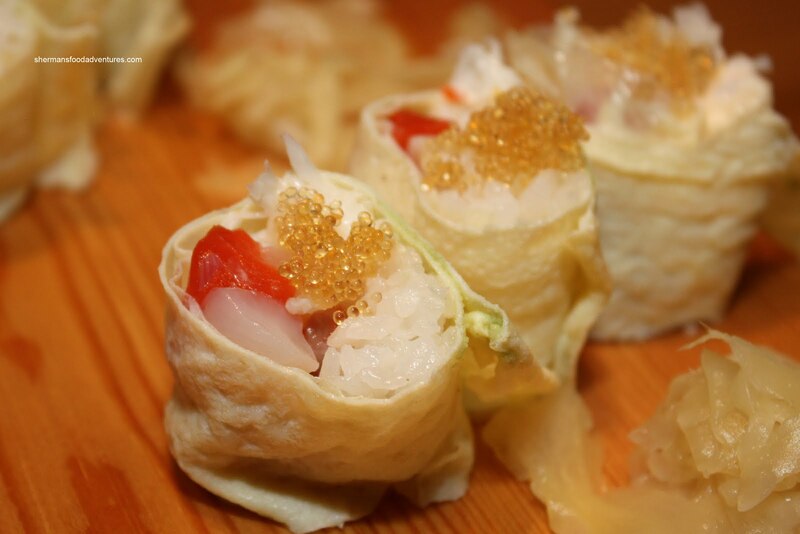 I did however get to try some sushi made by Tojo at a sustainable seafood event last year, including that delicious golden roll. Maybe I can scrounge up enough money to do the ala carte menu on my next visit! I was at Tojo's last week and was severely disappointed. We were on the a la carte menu and I thought that the fish was really good quality, but the grade was not top notch. Also, the menu is really small. I'd rather eat at Ajisai and eat some really fresh and good quality fish. Admittedly, not in Vancouver though, so maybe Tojo is the only game in town -- hence he can charge whatever he wants. Maybe I expected more from him. i was hoping you would cover this place at some point. too rich for my blood but an interesting concept. it looks tasty but $500 tasty? hmm. i'm always curious at how this place can stay open. i mean... there can't be that many people who can afford to eat here, can there? Well, if you read between the lines on this post, you'll see that I agree with most of you. In terms of "was it worth it?". When you look at what we got, of course not. I'm sure I can get something remotely close at a fraction of the cost somewhere else. But once, again, now that I've been, I can make comparisons. Ya my Japanese Friend also tells me too, a lot of Japanese do not like him. Also have anyone noticed lately on Vancouver tourism website and on their profile on Zomoto? He or someone is putting in claim that he is the FIRST sushi chef in Canada. The balls of this guy. As for his claim that he invented California roll, it is very hard to believe. First he claim he invented putting the rice on the outside, fine, but that does not make it a California roll. Now he claims that he name it California roll base on visiters from the US. Seriously why did he not name it the Washington roll? I would think there is more visitor from Washington State then from California. It is more pausiable that some guy from California invented the roll using locally grown Avocados. Canadian press should do a little research and question this instead of just blindly printing that he invented the California roll. I dined here before, it was ok. His $20 tempera was just tempura, nothing special.